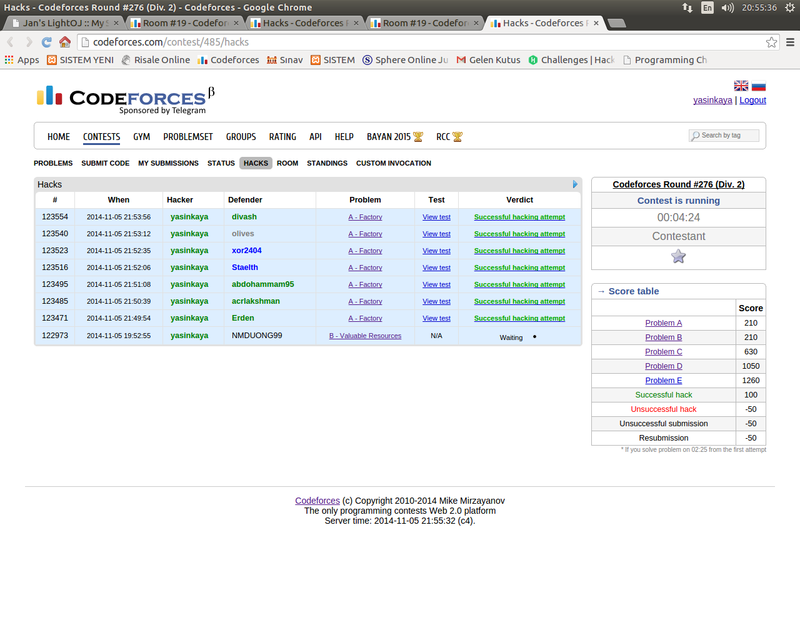 Today will be Codeforces Round #276, which take place in both divisions. Start time is 19:30 in moscow time (follow this link to see time in others zones). For preparing contest i say thanks to Zlobober, for translating to Delinur, and to MikeMirzayanov for project Codeforces. UPD Score distribution will be dynamic (see more information here). Problems will be sorted in increasing order of difficulty, however, do not forget to read all problems before the end of the contest. UPD The contest is over! Thanks to everyone who solved the problems despite everything. Analysis will be published later. UPD Editorial can be found here. Please short explanation for problems. --> Because read story of problems is too tedious. Also explanation of sample tests. For better understand problems. Please give me '-' till my contribution reaches 0 and then stop. In Visual Studio you can see good visualisation (screenshot is in previous edit) Is it what you want? Something like that. But also a bit different: it should be a graphic so I can take one look at it and know what went wrong. I think I'll have to write my own. It would be easy to parse the output such as what appears in your screenshot or of a profiler for either Python or C++. 1 hour later is very bad for China. It is 0:30 for us, what a sad story! It was 3:30am here when the contest started. These coding events remind me how much I like to work in the peace of the night. It's 10.30Pm in Bangladesh. Quite a good time. Hi, I keep receiving emails in Russian for the contest announcements. Can I switch this to English somehow? I am always curious to know why do the authors declare the score distributions at the last moments. Has it anything to do with the number of registrants?? Server is too busy and can't open any of the problems, is it only me? The server is very busy, it's impossible to submit or even access to the statements ! I don't know what happened, but there are more than 1000 submissions waiting for judging. I can't send any problem. Is the round going to be rated? It's 11 p.m. I tired to wait. And I'm going to sleep. Nice set of problems, but the system is making it almost impossible to compete. Agreed, the last 3 problems look equally challenging. Yes. 30 minutes to send the solution, waiting the submit page opens..
seems round will be unrated ;( ... anyway, keep solving! "This round will be unrated due to technical issues." if contest rated , I will up rating, but it is unrated. I am very sad ! Open all the problems as soon as the contest starts.. Works for me everytime..
After the contest started I thought, "Awesome problems, awesome statements. I really hope I everything goes well today! :)" An hour later... "Long queue, contest is unrated for technical issues". Now I'm thinking, "Why did I have to jinx it?! :(("
I know it's more like a server fault. But I noticed that Div2A points were changed twice. First it was rated 1000, then 500 and now 1000 again. So, I do suspect that some way or the other, Bugman is at fault, if not majorly. Update: It's 500 point problem again. The points are changing only because the score distribution is dynamic. If C is solved by many people by the end of the round, it will probably bring only 500 points. I know its dynamic. The guy in the top of my room had 900+ point in problem A. Now he has 480 points. The score of an individual changes after correct submission too? I'm sorry, I didnt knew about it. I don't think you know the correct meaning of dynamic scoring. The scores change based on the number of correct submissions on a problem. The lower correct solutions, the harder the problem is thus higher the score and vice versa. In Soviet Codeforces, you can't take it back. Aren't you aware of the Russian proverb: "a word ain't a sparrow: once released — it can't be recaptured"! If only I can punch person to death I will punch myself. Such a waste of precious sleeptime. contest is unrated . . . keep calm and . . start self mutilation. . . :-"
Solves div2 C in 5 minutes -> unrated round. Is anyone having trouble locking problems? i want to try to hack some solutions, but i can't seem to find the button to lock a problem. Keep calm friends. I know codeforces is not doing well today, but instead of backfiring at it why dont you try to solve the problems, or even go to sleep, than blaming contest writers, platform etc. Remember, the joys the platform has given you, the job you got by practicing at this platform, the money, fame so many things. And one day it is bad and you show this attitude towards it. I am sorry If I sound harsh, but it preety much shows people's character. It was not directed particularly to you mate, but to all such comments above. Remember, remember the fifth of November, the Gunpowder treason and plot; I know of no reason why the Gunpowder treason should ever be forgot! I guess Codeforces system blew up in the spirit of Guy Fawkes Day! 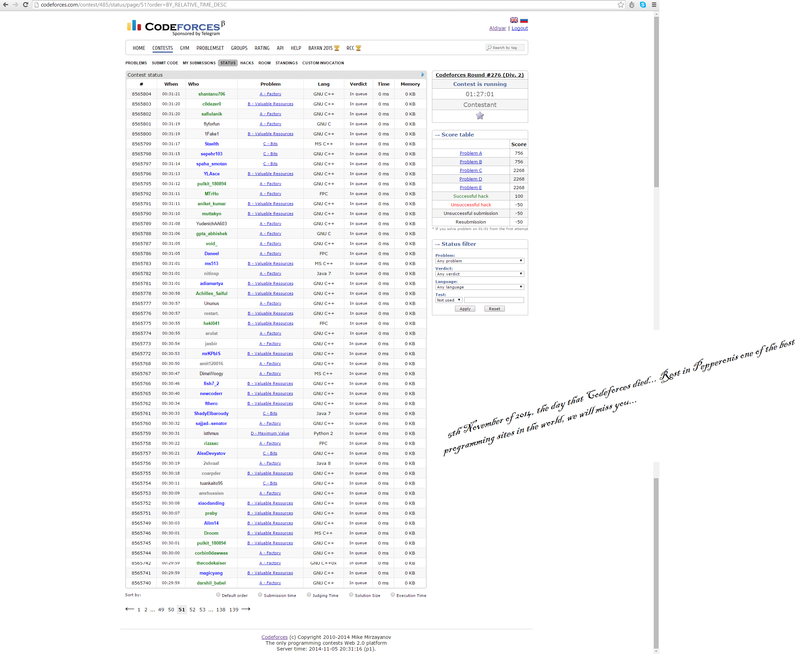 But in serious matter, there were 5000+ competitors and this is the 276th round. One would expect the system to be more stable by now. I personally feel sad for Bugman because that was one good problemset and I think he deserves some credit and I'm quite sure that it wasn't his fault at all. And about changing problem scores mentioned above, scores are dynamic, of course they will change! it is my worst contests always "Busy Server" or "in queue"
rating would have improved if the server didn't hangup :\ sad day!! There are still 40 minutes remaining, but I'm very sleepy. I will sleep now. 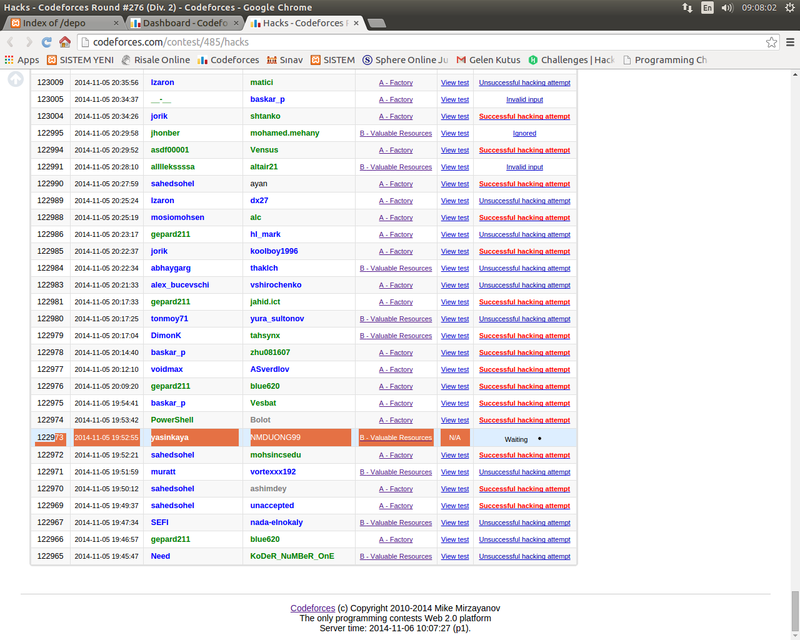 judging code used old version of our http-wrapper library with resource-leak. Sorry again about it. I apologize to the writer Bugman he did his job great. Be sure, some sleepless nights are waiting for me! I also want to say thank you for those who didn't stop participating just because of contest being unrated and who continued solving nice tasks that Bugman prepared. I hope that we will see new contests set up by him again! The kernel remounts a filesystem read-only if it encounters an I/O error on the underlying device. If this is what happened, then the kernel log should contain the details. MikeMirzayanov, can you confirm if what andreyv said is what happened? me curious! how to solve div-1 d .
You want to partition the sequence in subsequences each of which will be "going up" or "going down". Solution is a DP where you state is (position, down or up). "The sum of one increasing function with one decreasing function is a function that increases and then decreases." Not so sure, that's why I don't know if my solution is actually right. My intuition was telling me to assume that dp + max — min is a function that can be ternary searched. yields 10 11 10 11 which increases, then decreases and finally increases again. Yeah, you're right. I guess the lesson is not to trust your gut at all times, they may be wrong! Could you please explain why this works? I looked at it for a long time, but I can't figure out what x and y represent. Thanks in advance. Therefore it is sufficient to remember and update the maximum values of ansj + aj + 1 (y in my code) and ansj - aj + 1 (x in my code) at each step. When will system testing begin? How I solve problem D? Thanks for the Nice problemset Bugman , I just wanted to tell you that I enjoyed the round despite the technical difficulties that were being caused by codeforces . PS:If you like what I have said above then give it a '-' . Is there some tricky case for Div1 A/ Div2 C? I solved it as follows: let the answer be stored in res. go through the bits of the 2 numbers(from left to right). If the current bit is 1 in both then set that bit in res. If it is 1 in r only then set it to 0 in res and make all next bits 1. In the end count the number of 1s in res and the number of 1s in r. output the one with the max. All problems are very interesting. Thanks to Bugman. When you are as bad a coder as me then technical difficulties are not such a big problem for you! :P My only submission was Div2 C at 2 hours 7 minutes past the start of the contest and it got tested without any delay. We can prove that each groups must be increasing or decreasing. So we can solve it in O(N) with using ordinary DP. Lol, how simple. Reminds me of 383D - Антиматерия with a long explanation for the official solution and a short one for the one most people found. I like D , I tried to solve it ( but got TL ) with DP , ternary search and segment trees. I have seen Div1 B in a Japanese high school programming contest. greedy will work :). let b = number of bit in R (upper bound). now start from res = (1<<b)-1. (all the bit 1) now start removing power of 2 from right to left until you have res in the given range. Thank you man!) I will try to solve it, later. when I say increase number of 1s , I mean add 1s in the 0-positions from right to left, every time you add an 1 digit the result number is the minimun number with 's' 1 digits ( s = current number of 1 digits in the result number ) greater than ri , you can prove it. How is Div2-D / Div1-B to be solved? huh!, Codeforces community is busy with up-voting instead helping the guy. Thank you Bugman for this amazing round. I took the best place I ever had, and that gave me faith. My self esteem is in your debt. Why do we need to run the loop 'm' times in Problem A of Div-2?.. I have the same question can someone please explain? in case we have 65535 65536, Answer is "Yes". so , we must check until m or else we may get a wrong answer in this brute force method . Quite a nice contest :) My first hack ever! Thank you Bugman. Why rating system is too slow? Or is it a unrated contest?? Yes, due to technical reasons round is unrated. Just wondering, is this the first time for a contest being unrated? Anyway the div2 problems are as good as your last contest. Thanks, Bugman. No, unfortunately this is not the first time. The problems was really nice. But frankly saying, The English description of problem A was quite bad. If check visually, seems that checker printed both string of length 6, no more symbols, spaces or newlines. I don't get it. Why is it WA? I didn't expect that it can be a reason of WA, but it's caused by zero byte. Country wise rankings have been updated for this contest. Although I know many people left the contest half way, including me, but still had to update the site. Server time: Apr/19/2019 01:52:43 (f2).